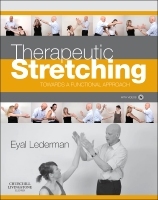 Welcome to the companion website for Therapeutic Stretching: Towards a Functional Approach, by Eyal Lederman DO, PhD, Director, Centre for Professional Development in Manual Therapy, London, UK & Senior Lecturer at University College London (UCL) Institute of Orthopaedics and Musculoskeletal Science. This website includes a 40 minute demonstration of functional stretching applied to the shoulder, elbow and spine. In particular, it explores the use of this stretching approach for recovering and improving range of movement (ROM) in these areas. Readers can access the videos by registering on the site following the simple log-in instructions shown by clicking the Access the Videos menu. Helps transform thinking about the therapeutic value of stretching and how it is best applied in the clinical setting. Examines the difference between therapeutic and recreational stretching. Focuses on the use of stretching in conditions where individuals experience a loss in range of movement (ROM). Explores what makes stretching effective, identifying behaviour as a main driving force for adaptive changes. Discusses the experience of pain, sensitization and pain tolerance in relation to stretching and ROM recovery. Applicable to a variety of perspectives including physiotherapy / physical therapy, osteopathy, chiropractic, sports and personal trainers. Ideal for experienced practitioners as well as those taking undergraduate and postgraduate courses.